I consider any work of art that stands apart from what the mainstream “art world” is cranking out to be worthy of attention every now and then (well, not just “now and then,” dang it, all the time). This goes especially for architecture. I think we, in western culture, are so accustomed to the glass box high rises in our cities that we don’t really notice little gems of architecture that are truly individual. Every period in the history of art has had standouts in this vein. 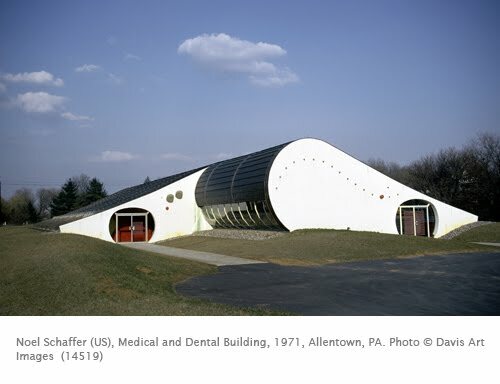 I’m sure that this little medical-dental office is not going to be listed in major art history surveys, but I find it to be a fascinating statement about what was going on in architecture in the 1970s. During the 1970s, modernist architecture began to veer away from the severe, sterile International Style (I call it glass box architecture) that had dominated western skylines since the 1950s. Mies van der Rohe and Skidmore, Owings and Merrill are prime examples of this style. While the idea of form following the function of a building persisted in the 1970s, many architects approached it in innovative new styles that reflected evolving influences: ecology, utopian architectural communities (such as Paolo Soleri), and, eventually, historical architectural styles (which led to Postmodernism). Having grown up in the 1970s, I can remember not just a preoccupation with modernism, but an actual interest in envisioning what “the future” would look like in architecture. Granted, this led to some bizarre, impractical designs, but, the architecture of the early to mid-1970s is fascinating when one tries to figure out what the architect was thinking. Such is the case with this little “medical-dental building” in Allentown. Is it the product of an ecology-minded architect who was attempting to make the building seem to roll out of/into its surroundings? Or was it his vision of a “21st century” building? If I had grown up in Allentown at the time and had doctor appointments in this building, I would have thought that it was totally awesome, like being in Star Wars or something. After looking at this building, ask your students to design a building that they think reflects the purposes of a medical center.